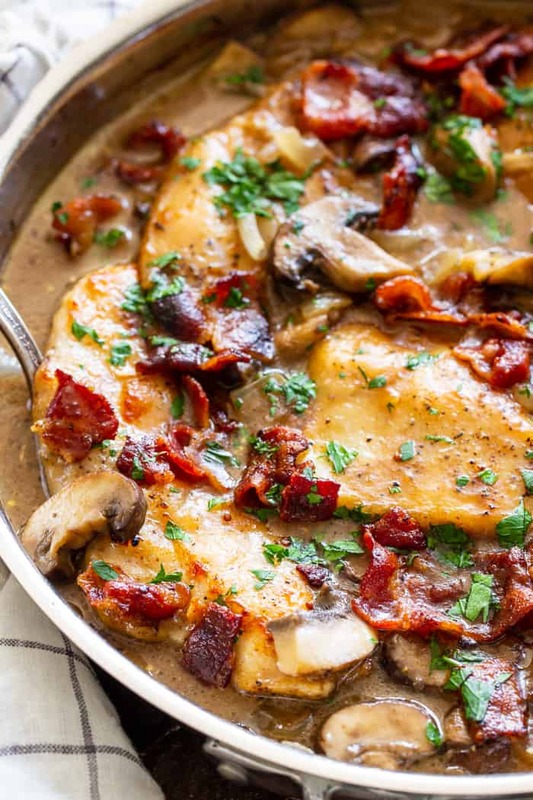 This one-skillet paleo chicken marsala is loaded with flavor! 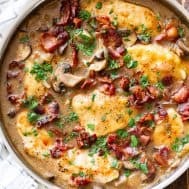 Juicy chicken, a creamy mushroom sauce and crispy, savory bacon make this a recipe you’ll want in your dinner rotation! 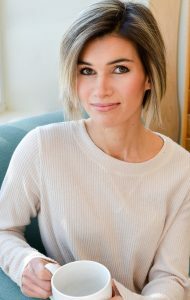 It’s dairy-free, gluten-free, Paleo, and Whole30 compliant. 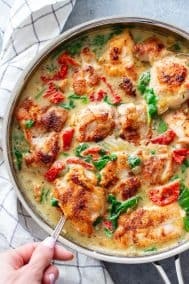 Another one-pot chicken recipe that’s going to be a favorite! 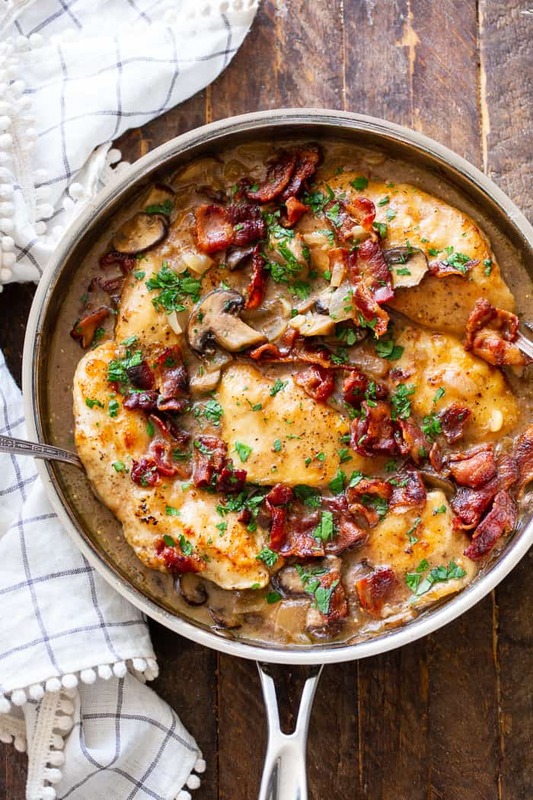 Chicken marsala is one of those meals that for SOME reason, I haven’t had since pre-paleo. 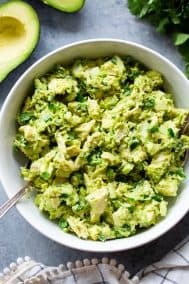 Not because it isn’t delicious enough to want to re-create, but because I had some sort of mental block about doing it the “right” way, yet making it paleo. Well, surprise! It’s actually totally possible to make it both paleo and totally YUM – tasting the way chicken marsala should taste. Oh, and because I had some on hand and just couldn’t resist – I added bacon for some extra flavor – hope you don’t mind! I began with thin-sliced chicken breasts, seasoned and very lightly coated in tapioca flour to keep ’em juicy. I cooked the bacon, then fried the chicken in some of the leftover bacon fat – one of the reasons I can’t resist cooking with bacon. After setting aside the chicken, I made the sauce – super simple. Some sautéed onion, mushrooms, and garlic, with bone broth, coconut milk, and balsamic vinegar. I also added a bit more tapioca with my liquids for extra thickness, and a little bit of mustard and nutritional yeast for flavor. I find that when using coconut milk, the mustard and nutritional yeast help cut the coconut flavor, but these two are entirely optional in the recipe. After the sauce cooked a bit, I added the chicken back in to further thicken the sauce (the tapioca coating from the chicken does this!) and allowed it to simmer just a few minutes. I hate overcooked chicken, so I’m careful not to keep it simmering too long. Even with the coating and that creamy sauce chicken breasts have the tendency to dry out. For the last minute, I crumbled the cooked bacon back into the skillet – definitely don’t want to forget this step! It’s dairy-free, paleo, gluten-free, Whole30 compliant and relatively low in carbs too – with 12g per serving. I hope you’re ready for an easy, super tasty paleo dinner that will surely make its way into your dinner rotation! Leftovers save very well too – it’s win-win here. Okay, grab a big skillet and all your ingredients because it’s time to cook – let’s go! 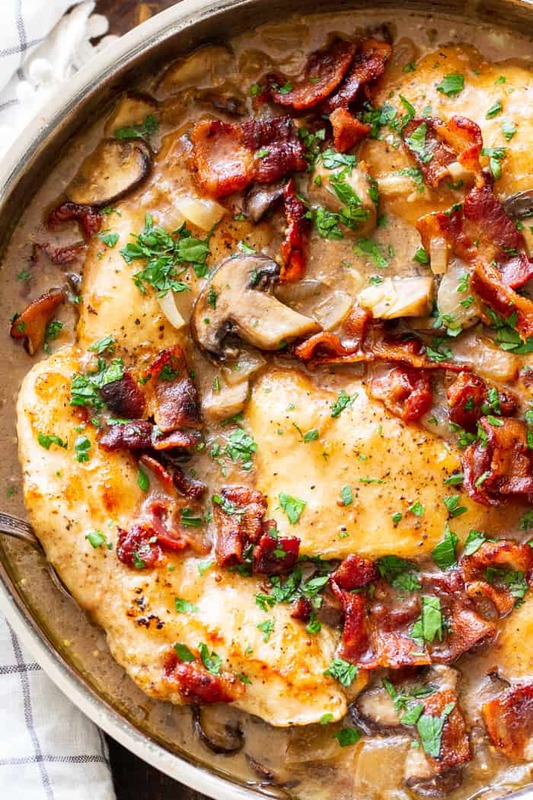 This one-skillet paleo chicken marsala is loaded with flavor! Juicy chicken, a creamy mushroom sauce and crispy, savory bacon make this a recipe you’ll want over and over! It’s dairy-free, gluten-free, Paleo, and Whole30 compliant. In a large deep skillet, cook bacon on med-high heat until crisp, then remove and drain on paper towels. Reserve bacon fat in a container, then wipe the skillet of burnt bits. Return skillet to medium-high heat and add 2 Tbsp bacon fat (or preferred cooking fat. Place 3 Tbsp tapioca on a plate or in a very shallow bowl. Sprinkle chicken with sea salt and pepper on both sides. Coat chicken in the tapioca and shake off excess, then add to the hot skillet. Allow one side to turn golden brown (about 3-4 mins) then flip. Repeat with all chicken, working in batches if necessary. You might need to add more cooking fat if frying the chicken in batches. Once chicken is done, set aside and lower the heat to medium. Add the remaining 1 Tbsp bacon fat, then add the onions and cook until translucent. Add the mushrooms and garlic, another pinch of salt and pepper, and continue to cook another 3-5 minutes to soften. Mix the 1 tsp tapioca into the broth, then add broth to the skillet, along with the vinegar, coconut milk, mustard, and nutritional yeast. Stir and bring to a boil, then lower heat to a simmer and add the chicken back in, simmering for 3-4 minutes to thicken the sauce. For the last minute, crumble the cooked bacon into the skillet to heat through. 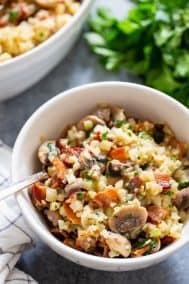 Serve over cauli rice, veggie noodles or with roasted potatoes. Enjoy! 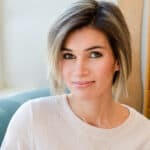 Notes: To lower the carb count for a keto diet, you can omit the tapioca starch OR only very lightly coat each piece of chicken, using about 1 1/2 Tbsp total. Want More Paleo One-Pot Recipes? Try One of These! Can you possibly sub Almond milk for the Coconut milk or would it mess with the texture and everything? All of your recipes are so delicious, can’t wait to try this one. Ok, I rarely cook but I have been thinking about going paleo so what the heck. Thin sliced chicken? What does that mean? Cut like a bagel? Like pancetta? What in blazes is tapioca? It comes in flour? How do I keep raw chicken in check? Clorox anyone? Coconut comes in cans? Turns out yes, and is solid! Ok, thinned out with stirring. Sea salt? Hmm – wait, what was in that silent auction basket? Himalayan salt! Bonus! How brown is golden brown. And how dry is that? Ok, came out ok – a little bland but nice earthy taste. Did I measure the salt and pepper? Nope real men don’t ask directions or measure. Served with brown rice. The more I ate it the more I liked it. Not tell anyone I can cook! 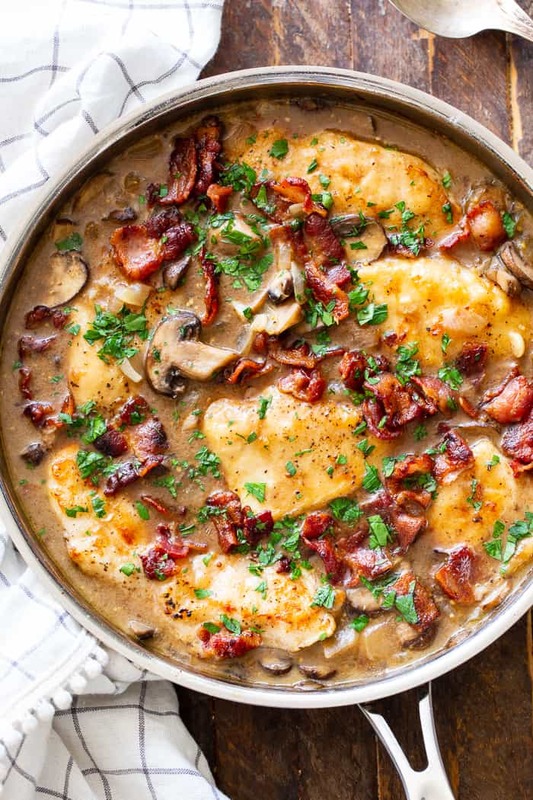 Chicken Marsala has always been one of my favorite dinners! I haven’t had it in while so this recipe will have to change that! Delicious! We thoroughly enjoyed this recipe. I couldn’t really taste the coconut & the chicken was very soft & tender. Best thing too I have enough for my lunch tomorrow yummy 😋. 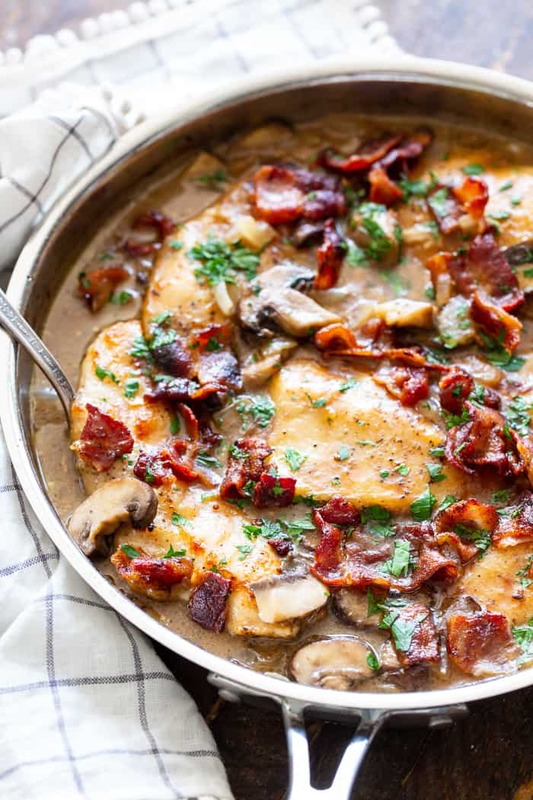 Chicken Marsala is one of my go-to dishes. I’ve used the recipe from cooking with engineers which is very simple and delicious, and I’ve used a recipe attached to the Florio Marsala bottle that we like just a bit better. and This one is very good thanks for sharing. I used chicken thighs instead and the chicken alone with arrowroot flour was crispy and great to eat without the sauce. Didn’t have any bacon for this dish and it was still tasty. 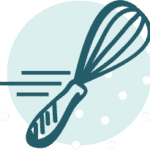 Thank you for sharing the recipe. Fantastic – whole family loved! Way too many Ads on your website?